We’d love your help. Let us know what’s wrong with this preview of The Oxford Book of English Verse by Christopher Ricks. Here is a treasure-house of over seven centuries of English poetry, chosen and introduced by Christopher Ricks, whom Auden described as "exactly the kind of critic every poet dreams of finding." 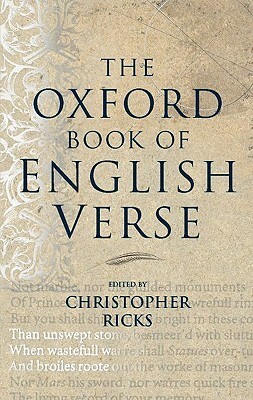 The Oxford Book of English Verse, created in 1900 by Arthur Quiller-Couch and selected anew in 1972 by Helen Gardner, has established itself as the foremost anthology of English po Here is a treasure-house of over seven centuries of English poetry, chosen and introduced by Christopher Ricks, whom Auden described as "exactly the kind of critic every poet dreams of finding." The Oxford Book of English Verse, created in 1900 by Arthur Quiller-Couch and selected anew in 1972 by Helen Gardner, has established itself as the foremost anthology of English poetry: ample in span, liberal in the kinds of poetry presented. This completely fresh selection brings in new poems and poets from all ages, and extends the range by another half-century, to include many twentieth-century figures not featured before--among them Philip Larkin and Samuel Beckett, Thom Gunn and Elaine Feinstein--right up to Ted Hughes and Seamus Heaney. Here, as before, are lyric (beginning with medieval song), satire, hymn, ode, sonnet, elegy, ballad, but also kinds of poetry not previously admitted: the riches of dramatic verse by Marlowe, Shakespeare, Jonson, Webster; great works of translation that are themselves true English poetry, such as Chapman's Homer (bringing in its happy wake Keats's 'On First Looking into Chapman's Homer'), Dryden's Juvenal, and many others; well-loved nursery rhymes, limericks, even clerihews. English poetry from all parts of the British Isles is firmly represented--Henryson and MacDiarmid, for example, now join Dunbar and Burns from Scotland; James Henry, Austin Clarke, and J. M. Synge now join Allingham and Yeats from Ireland; R. S. Thomas joins Dylan Thomas from Wales--and Edward Taylor and Anne Bradstreet, writing in America before its independence in the 1770s, are given a rightful and rewarding place. Some of the greatest long poems are here in their entirety--Wordsworth's 'Tintern Abbey', Coleridge's 'Rime of the Ancient Mariner', and Christina Rossetti's 'Goblin Market'--alongside some of the shortest, haikus, squibs, and epigrams. Generous and wide-ranging, mixing familiar with fresh delights, this is an anthology to move and delight all who find themselves loving English verse. To ask other readers questions about The Oxford Book of English Verse, please sign up. I must be turning into a real softie! This is a wonderful journey through nearly a thousand years of English verse and covers all subjects. This is a real reflection of many British poets those known and unknown. One of the best things about this collection of verse that it has all the usual suspects represented but not all their verse but a collection of many of their works minus some of their more well known writings. This is a wonderful and inspirational book something that I enjoy dipping in t I must be turning into a real softie! This is a wonderful journey through nearly a thousand years of English verse and covers all subjects. This is a real reflection of many British poets those known and unknown. Fairly Unhappy. There could have been passages from The Prelude, Shelley's Epipsychidion and Alastor, John Keats' O Solitude! , When I have fears and The Eve Of St. Mark, Tennyson's Break, Break, Break, Browning's Rabbi Ben Ezra, Prospice, Arnold's Thyrsis & much more influential real, authentic poetry. This obsession with filling the pages of a prestigious publication with a needless lot of Eliot and his semi or unpoetical successors gets on nerves. There is no James Thomson in this collect Fairly Unhappy. There could have been passages from The Prelude, Shelley's Epipsychidion and Alastor, John Keats' O Solitude! , When I have fears and The Eve Of St. Mark, Tennyson's Break, Break, Break, Browning's Rabbi Ben Ezra, Prospice, Arnold's Thyrsis & much more influential real, authentic poetry. This obsession with filling the pages of a prestigious publication with a needless lot of Eliot and his semi or unpoetical successors gets on nerves. There is no James Thomson in this collection, no Extracts from Summer, Spring, Autumn or Winter. There is no extract from Christabel, nor from Cowper's The Task. I still fail to understand this lingering lust for Modernist poetry, which is much poor in terms of execution and quality, even below the mediocre kind. The likes of real poets up till the mid nineteenth century are by and large treated dismally. There is even no Francis Thompson in this volume. In the days when there was actually a general audience for poetry, that audience's taste was both formed and reflected by anthologies which generally were created by by lovers of poetry -- the phrase, though it may sound pretentious, is the accurate one -- whose books were a quite conscious effort both to form and to reflect that taste. Today things are different: poetry has become largely an academic enterprise, and accordingly current anthologies tend to reflect not the taste of a general audience but the specialist jockeying that goes in English departments. There could hardly be a better example of this trend than Christopher Ricks's edition of The Oxford Book of English Verse. The book does have its points. Scottish poetry, traditionally a poor cousin, has been given something like its proper prominence. The selections from Elizabethan and Jacobean drama, whether or not they theoretically belong there, sure sound good. Matthew Arnold's "The Scholar-Gipsy", that bane of generations of sophomores with term papers due, has been reduced to a handful of stanzas which usefully demonstrate how bad a poem it really is. But taken as a whole, we find in this book that the anthologist's mission of portraying the sweep and blood of poetic tradition has been sacrificed to the department head's need not to hurt the feelings of anyone at the faculty meeting. It's not that the poems chosen are not worthwhile (though I for one could have done without Anthony Thwaite's tiresome poetry establishment in-joke of a poem consisting of all the names from Contemporary Poets, or Swinburne's really disgusting ode to foot fetishism and necrophilia, "The Leper"), it is that the necessity of satisfying all scholarly claimants leaves insufficient room for the poets and poems who really count. Since my brain has started to wither on the stem, I picked up the OBoEV with the goal of learning a poem a week. I'm falling short of the goal and some of the work can be a little Iambic but.... I've rediscovered the delights of the form. Take advice from this old Englishman--pick up a copy of the above and take a nibble of the pleasing passions of poetry. It will reduce stress, increase happiness, and put the world to rights. A rich and rewarding trove of some really beautiful poetry, whilst some poets are given more space than necessary and some are perhaps neglected Ricks' compendium is a wonderful place to explore, to discover, and to feed on the complexity and elegance of human thought and expression. Brilliant selection, beautifully produced. With so much poetry available for nothing on the web, this book reminds us why a great editor and a good publishing house can still make it worth buying hard copies. A must have for any poet lovers. A classic. Not often read, but kept around anyway, if only to look up poetry referenced in other works.